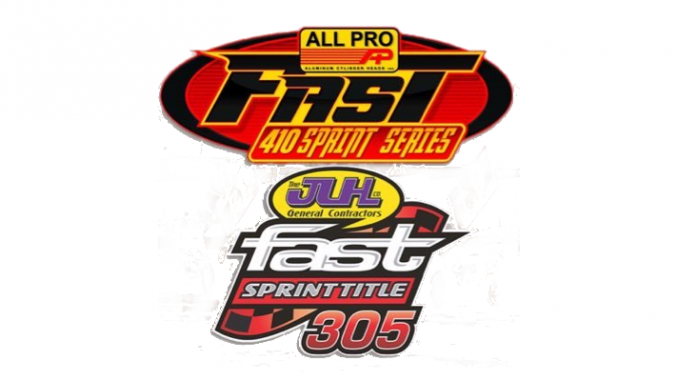 FREMONT, Ohio – The teams from the All Pro Aluminum Cylinder Heads FAST 410 Championship Series presented by Ohio Logistics and the JLH General Contractor FAST 305 Championship Series Presented by Engine Pro will do a little travelling for their upcoming events with a lot of money on the line. It all kicks off Friday, Aug. 3 at Limaland Motorsports Park in Lima, Ohio where the JLH General Contractor FAST Championship Series Presented by Engine Pro will make their third appearance of 2018. Current FAST point leader Jamie Miller scored the victory at Limaland on June 15 with veteran Alvin Roepke taking the win on July 13. Miller has scored seven overall wins in 2018 including five FAST events. Miller is the most recent series winner, taking the victory Saturday, July 28 at Fremont Speedway in Fremont, Ohio. The All Pro Aluminum Cylinder Heads FAST 410 Championship Series will visit Fremont Speedway Saturday, Aug. 4 for a $3,000-to-win affair. Fremont Speedway and FAST Promoter Rich Farmer has also announced the both the event at Limaland and Fremont on Friday and Saturday will pay the 305 sprint feature winner $1,000 to win and will utilize the FAST 305 purse structure. “Also, the top 10 cars in the 305 sprints cars during the weekend’s racing – from both Friday at Limaland and Saturday at Fremont – will receive a bonus of $200 or a free Hoosier Tire. That will be based on the average A-main finish of both nights. For example if a driver finishes second one night and sixth the other it would be an average of fourth,” Farmer said. Both the FAST 305 and 410 series will then travel to Mansfield Motor Speedway in Mansfield, Ohio for the 2nd Annual Great Lakes Dirt Nationals Presented by Lowe’s on Friday and Saturday, Aug. 10 and 11. The Buckeye Outlaw Sprint Series (BOSS) non-wing sprint cars also are in competition at Mansfield. Last year the inaugural Great Lakes Dirt Nationals drew over 140 cars in the three classes and Caleb Armstrong took the $15,000 FAST 410 win while Dustin Stroup scored his biggest payday winning the FAST 305 feature. This year’s event has a combined two-day purse of over $100,000. “There are some really big paying shows coming up to wrap up the FAST season. We’re excited and proud to be a part of the Great Lakes Nationals and be able to work with Cody Sommer to give race teams and fans a great race weekend,” Farmer said. On Friday August 10th, FAST 410 sprint cars will compete for $3,000 to win, BOSS non-wing sprints for $2,000 to win and FAST 305 sprint cars for $1,000 to win main events. On Saturday the FAST 410 sprints will battle for $20,000 to win with the FAST 305 sprints going for $2,000 to win and the BOSS sprints $3,000 to win. Going into the Saturday’s FAST 410 event at Fremont Speedway, two time series champion Craig Mintz of Gibsonburg, Ohio maintains a significant lead thanks to four straight wins at Fremont Speedway to start the season. Mintz currently leads Fremont’s track points as well. Fellow Gibsonburg resident Stuart Brubaker, a former FAST 305 champion, sits second in the 410 series points and has a FAST win at Attica. Henry is third in the FAST 410 points and has a series win at Attica and earned a victory at Fremont Speedway on July 28. Sandusky, Ohio’s Chris Andrews posted back-to-back FAST wins at Fremont last month and sits fourth in the FAST points. Tyler Gunn of Napoleon, Ohio has really come on strong as late as well, moving into fifth in the FAST standings. T.J. Michael of Plano, Texas is another driver who has come alive the past month and is sixth in the series standings. Rounding out the top 10 are defending FAST champion D.J. Foos; 2016 FAST rookie of the year Jess Stiger; 2018 FAST rookie of the year contender Kelsey Ivy and Duane Zablocki. Four time series champion Byron Reed has missed a handful of series events but has a FAST win at Attica and is 11th in the standings. Miller has a significant lead in the FAST 305 standings thanks to a stretch last month that saw him take four straight series wins. Fremont’s John Ivy, who scored the FAST win at Waynesfield Raceway Park earlier in the month, sits second in the series standings while young Tyler Street has moved into third in the FAST standings and Kyle Peters into fourth. Brandon Moore heads into Limaland having slipped to fifth in the FAST points with Kyle Capodice, Seth Schneider, former FAST champion Bobby Clark and Matt Lucius rounding out the top 10. Two-time and defending FAST champion Paul Weaver, who has five overall wins in 2018, has battled back from some health issues to sit 11th in the points after taking his second series win Friday, July 27 at Attica Raceway Park. Pit gates open at Limaland Friday, Aug. 3 at 4:30 p.m. with grandstand gates open at 5 p.m. and racing at 7:30 p.m. General admission for ages 16 and older is $12, ages 11-15 are $6, and kids 10 and under get in free. Pit Passes for all ages are $25. Get all the details by visiting www.limaland.com. Tickets and camping information for Mansfield Motor Speedway are on sale now at www.MansfieldMotorSpeedway.com. Additional information for competitors and race teams is now available online via the “COMPETITOR GUIDE” which may be found at www.MansfieldMotorSpeedway.com/CompetitorInfo. Also, the Great Lakes Dirt Nationals will be broadcast live on Pay Per View at www.speedshifttv.com. Tickets for the Great Lakes Dirt Nationals are $19 for adults Friday; children under 10 get in free; reserved seats are $29. Saturday general admission tickets are $29 with children 10 and under free and reserved seats are $39. Pit passes are $30 on Friday (children under 10 are $15) and $40 on Saturday (children under 10 are $20). FAST On Dirt, Inc. would like to thank the following contributors to the 2018 FAST Series point fund: All Pro Aluminum Cylinder Heads, Ohio Logistics, JLH General Contractors, Engine Pro, Kistler Racing Products, Engler Machine & Tool, CP-Carillo Pistons, Design Graphics Group Inc., SCS Gearbox, Reebar Die Casting, Hoseheads.com, Level Performance, Young’s RV Centers, Gressman Powersports, Hoserville Ohio, Jon Wright’s Custom Chrome Plating, Fremont Fence, Baumann Auto Group, Fricker’s, Goofy Golf, NAPA Auto Parts, Hoosier Tire, UNOH, Welty Financial Services, EZ Shop, US Army, Weld Racing Wheels, Joe and Fran Darmofal and the Pub 400 of Fremont. Based in Fremont, Ohio and owned by long-time racing supporter Jon Horn, The JLH Co. LLC is your one-stop for custom home remodeling, plaster restoration, and drywall installation services. Their dedicated craftsmen will help you build the home you want out of the house you have. You can also trust JLH for construction services, including garages and pole barns. JLH also provides custom siding, roofing and window installation. For more information call Jon Horn at 419-559-9449. Headquartered in Findlay, Ohio, Ohio Logistics provides all the assets and operational support necessary to meet your most sophisticated logistical requirements. The company’s story is one of very impressive growth. Started in June of 1988, Findlay’s Tall Timbers Distribution Center, Inc. opened in the General Purpose Foreign Trade Zone #151 in the Tall Timbers Business Park. By 1996 the company had grown to 5 locations in 3 States and started doing business as Ohio Logistics. Currently Ohio Logistics is in 18 locations in 6 states operating over 6,000,000 square feet. Built on a sound financial base, Ohio Logistics will strive to exceed your expectations regarding your leasing and supply-chain management needs. 2. Stuart Brubaker – 118 pts. 3. Cap Henry – 159 pts. 4. Chris Andrews – 184pts. 5. Tyler Gunn – 238 pts. 6. TJ Michael – 274 pts. 7. DJ Foos – 290 pts. 8. Jess Stiger – 410 pts. 9. Kelsey Ivy – 535 pts. 10. Duane Zablocki – 568 pts. 1. Jamie Miller, 2433 pts. 2. John Ivy – 104 pts. 3. Tyler Street – 178pts. 4. Kyle Peters – 194 pts. 5. Brandon Moore – 196 pts. 6. Kyle Capodice – 215 pts. 7. Seth Schneider – 262 pts. 8. Bobby Clark – 302 pts. 9. Matt Lucius – 574 pts. 10. Dustin Rall – 1056 pts.